The commercial grade metal Backdrop Stand is a very popular choice due to the fact it is adjustable, portable. You get the best bang for your buck! Made from Metal, not Plastic. Don’t be fooled by cheap knock offs if you are looking for it to last long term. Jumbo Stands are used for a Trade Show Backdrops, Step and Repeat Media Walls, Event Marketing and more. Maximum Width depends on the particular stand you order….. they range from 8 feet, 10 feet and 12 feet wide versions. Hemmed Pole pockets on the top and bottom allow you to stretch the banner to ensure it remains wrinkle free. These are our Economy Stands and at first seem daunting to set up. Step and Repeat Backdrop or Tradeshow Display. This Black or Silver Portable Exhibition Backdrop Stand can be used for Large Banners and also Backdrops. It comes in a few adjustable sizes. 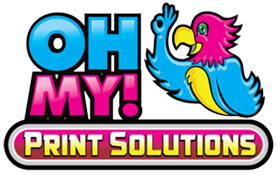 Also, they can be set up instantly for Trade Shows, Step and Repeat Media Walls, local fairs, store promotions. Exhibitions, conferences, award shows, seminars and presentations, and retail applications. Furthermore, the list goes on and on. Make a Big Impression at a low price! The whole banner stand is lightweight and also durable. Easy to transport with an soft portable carrying case. Durable and Heavy Duty Hardware. Furthermore, designed for frequent use at Trade Shows and Events. 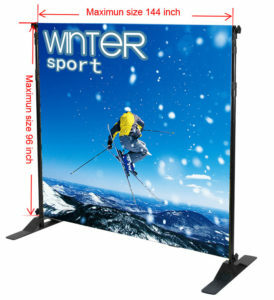 Various Sizes – Can be adjusted from 44″ to 144″ wide. Depending on stand and 36″ to 96″ height. Set up time of about 5 minutes. Also, it is portable, easy to transport with a carrying case. Moreover, Fabric Banner Backdrop has hemmed pole pockets on top and bottom to hide the frame. 1 x Premium Fabric Backdrop (Optional) – Single or Double Sided Printing. Also, 1 x oxford canvas carrying case. Free Shipping to places such as Montreal, Vancouver, Toronto. Calgary, Edmonton, Kelowna, Victoria, Regina, Halifax. Washington DC, Seattle, Ohio, Florida, and more!